Stuffed Avocado with Shrimp | Food, glorious food! Refrigerate for a 30 minutes. 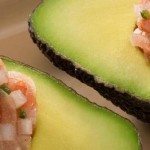 Just before serving, cut each avocado in half and take out the pit. Spoon marinated shrimp into the avocado halves and devour.